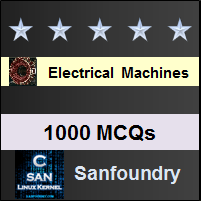 This set of Electrical Machines Multiple Choice Questions & Answers (MCQs) focuses on “Losses and Efficiency”. Explanation: Adding the external resistance reduces the starting current and increases the current. 2. Insertion of external resistance in the squirrel cage induction motor _________ the current, ________ the starting current. 3. Rotor ohmic loss is ________ slip. Explanation: Rotor ohmic loss is direct proportional to slip. Explanation: The ohmic losses will increase as the slip will increase due to reduction of slip. Explanation: To overcome the inertia the starting torque of the induction motor is slightly more than full load torque to start. 8. For achieving high starting torque and high operating efficiency an induction motor should have _______ rotor circuit resistance and _______ circuit resistance under operating condition. Explanation: At starting the rotor circuit resistance must be small and while operating under normal conditions the resistance should be low to reduce losses. Explanation: To increase starting torque, we need to increase the rotor resistance. Explanation: The maximum slip is obtained at the condition of start is when r2 = x2. Explanation: All of the losses mentioned occur in an induction motor. Explanation: Due to the low frequency of the emf induced in the rotor, the iron losses are reduced. 13. In an induction motor, what is the ratio of the rotor copper loss to rotor input? Explanation: It is the torque under which synchronous speed would develop a power of 1 W or power input to rotor in watts. Explanation: Increasing the resistance will reduce the speed at which maximum torque will occur.